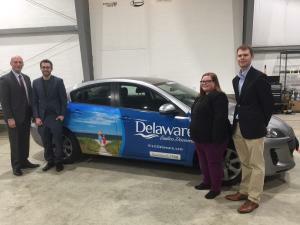 WILMINGTON, DE (Jan. 25, 2019) – The Delaware Tourism Office (DTO) and Carvertise, the Wilmington-based vehicle advertising company, today announced an exciting new program to share the state’s endless discoveries. Visitors who take Uber or Lyft vehicles to or from the New York Times Travel Show at the Jacob Javits Center in New York City, which starts today and runs through Sunday, will have the chance to arrive or depart in one of six Delaware-themed vehicles wrapped by Carvertise. The images represent each of the state’s three regions and feature some of the most popular attractions for visitors, who bring $3.3 billion annually to Delaware. The New York Times Travel Show is one of the nation’s largest travel shows, attended by more than 30,000 leisure travelers and industry professionals. It is also one of the biggest events the Delaware Tourism Office attends each year. In 2015 DTO and Carvertise worked together on a campaign in which vehicles traveled the Philadelphia region for three months generating more than 10 million impressions showcasing Delaware’s endless discoveries and its $3.3 billion tourism industry. That was the first time a Delaware state agency worked with Carvertise, which was founded in 2012 by Greg Star and Mac Nagaswami while they were students at the University of Delaware. Carvertise co-founder Greg Star, said the company welcomed the chance to work again with DTO, especially on such a high-profile initiative.